When the vampire fashion got trendy thanks to the Eclipse Saga and personal dark charm of Kristen Stewart, I thought it would pass in a year or two. However, vampire aficionados are persistent kind, and bloodsucking seems to have developed into a sub-culture of its own. With the innate rejection of how the world works these days, I can’t blame people escaping into fantasy worlds; I just wish these worlds were more joyful and inspiring than the sinister and decadent underverse of sub-human, light-fearing creatures that feed on human babies and hate their own kind. 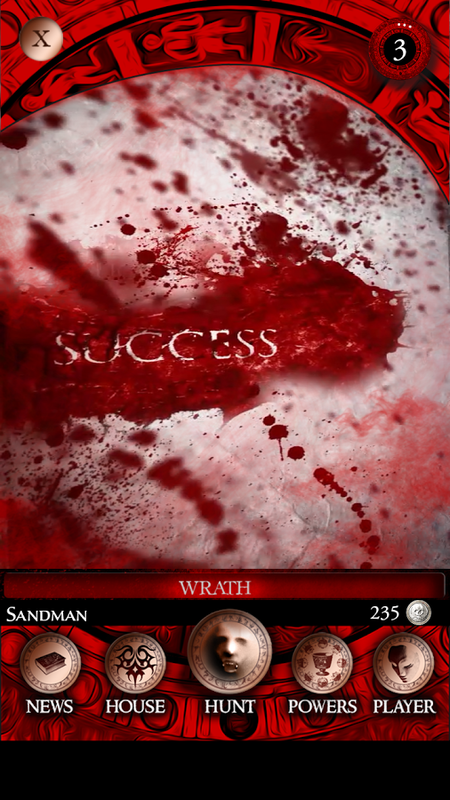 Vampire Tribunals was first launched on iOS and US-exclusively, but now it treads firmly across Android platform, worldwide. So, good people, arm yourselves with silver bullets, holy water and firm faith in whatever good you believe in because chances are your neighbors have already converted in the living dead children of Vlad, the Hungarian Prince Drakula. Being an online multiplayer game, Vampire Tribunals taps into your GPS to display the nearby feeding grounds, but can also take you to a different location through its Janus Mirror, a portal that will transport you wherever you want on this planet so that you can attack other vampires, go on quests, collect rewards and climb the vampire leaderboards. Personally, I oppose games that track my physical location for privacy concerns. If a game does that, there must be a justified reason. 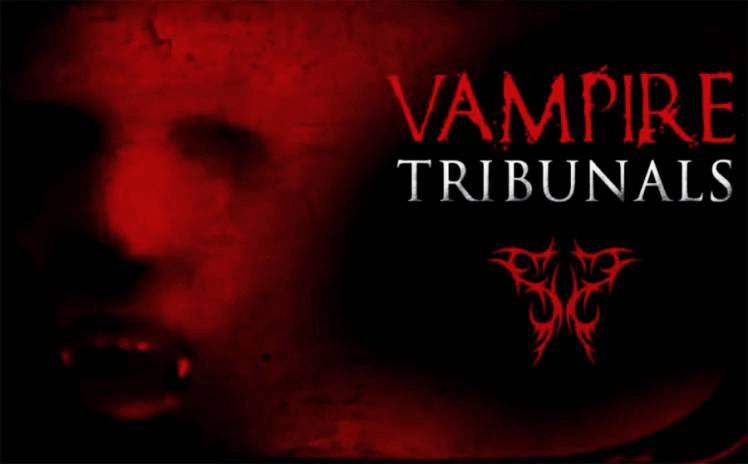 Let us see if Vampire Tribunals is worth compromising on your privacy. Players here are called ‘damphyrs’ and you can’t really tell who the vampire is, and who damphyr is. You create an online account and start your adventure, which primarily consists of wandering around the map and looking for what you can do there. Somehow, you can interact with things that are in your approximate vicinity, in the real world, that is, so at best you can find a Vampire Tribunals player on a subway as you commute, but may fail to find one when you are at home. How this translates into gameplay is a pretty tough question because it mostly depends on where you live. I imagine SF or LA dwellers, as well as campus residing students might find them company, but if it’s a small town, you may have difficulty finding an object to target. As a result, gameplay may be either relatively fun, or plain boring. If your radar finds a victim, though, you tap on it to select from a number of actions, after which you will see a short video or an animation that displays the graphical outcome of your action. There you go. I really don’t see anyone enjoying it but the people who love everything vampire and feel excited looking at everything red. 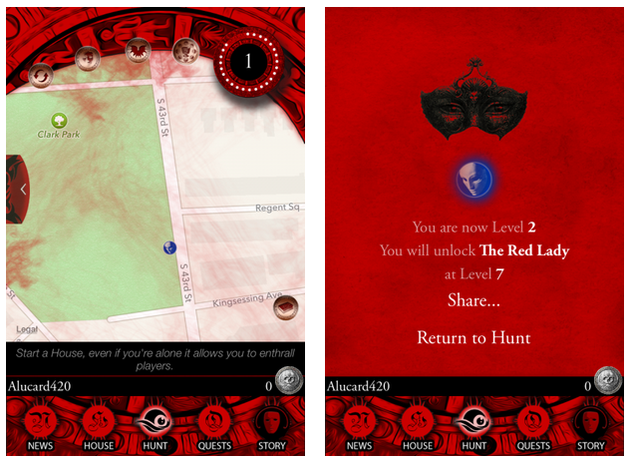 The game itself, however, is an IAP-loaded location-based menu selecting, which packs plenty of vampire gibberish, a whole load of lore and a pretty slow, if not boring, gameplay. The main issue, besides privacy concerns, is the fact that you don’t always get to play it if there are no potential targets around you. Yes, the Janus Mirror can take you elsewhere without you having to physically move, but it is seldom available to non-paying players, and is otherwise available via in-app purchases. The fact that you have to be in a public place, or commuting, hinders the gameplay, which is better experienced in a quiet, or better quiet and dark place. The two factors are somewhat mutually excluding, unless you want to pay for the Janus Mirror. On the other hand, if you are after a sinister read and vampire attire, go ahead and try it out, and maybe the dark fantasy of becoming a virtual creature of the night will get you hooked. Damphyrs are sort of under-vamipres that need to hunt during a 90-day season, which is called a Tribunal. During World Events, you will be hunting and ranking up until the end of the season, the Reckoning. The game adds a load of quests and missions, and lets players sign in via their social network accounts, invite their friends and create guilds to stalk other guilds and rise up the leaderboards, which can be fun if you have a bunch of friends who are equally crazy about vampires. However, you’d have to be in a fortunate location to engage in a more or less active gameplay. There are blood vials and spell cards that let you boost your dark energy, but before you can become a fully-fledged vampire, you will need to read through a 52-pages long story of a vampire, which is well-written, detailed and pretty immersive. Then, you complete the initial quests, look for powerful friends and accumulate Drachs, which are in-game currency. With Drachs, you can buy spell cards. By the way, when you are not online playing, other players can hunt you down and attack, so it’s better to hide in the free sanctuary while you are not playing. You will have to join or create a House in order to advance in the game because you need allies to strengthen your House and collect blood vials and gems to level up together. The news section will show you the best places to hunt. You have the considerations outlined, and I think it’s pretty clear the game is for vampire fans that get high with everything seemingly sinister. Is the game sinister enough to get you hooked? I am not sure, but if you played it and enjoyed it, let us know your impressions in the comments below.